Hudson Valley Pole Arts is located in midtown Kingston, in the historical Shirt Factory! 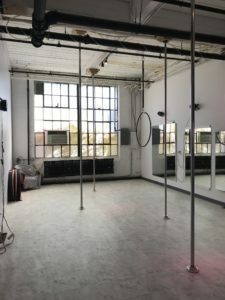 A revitalized industrial space, the Shirt Factory is a unique community of artists and artistic businesses, and a perfect fit for Hudson Valley Pole. Like most aerial studios, this beautiful space features very high ceilings; this means safety is a major priority. How do we keep our students safe, you ask? Firstly, we utilize industry standard equipment. Our 6 poles are Platinum Stages brand, stainless steel, and uncoated, and each pole can be set to spin mode. Most reputable studios around the globe use and TRUST this brand of pole to keep their aerialists safe. We also practice safe training habits. Our #1? DON’T BE LATE TO CLASS. Just because our apparatus is vertical, doesn’t mean it’s any less intense than yoga, cycling, gymnastics, or martial arts. Our classes are LEGITIMATE fitness classes, and we begin every session with a full-body warm-up. Because of this, arriving late is a liability to the studio. Students who are late by 8 minutes or more, are not admitted into class and their reservation will be cancelled. And lastly, we are the ONLY studio in the Hudson Valley to hold internationally-recognized certifications; specifically ACE/AFAA pole-fitness certifications. What does that mean? XPERT and ElevatED certifications are the most comprehensive courses of its kind, being accredited by the top fitness certifying organizations across the globe – ACE, AFAA, REPSUK, REPSSA, REPSNZ, Fitness Australia, Skills Active & Active IQ – and is endorsed by PDC. Some studios believe in-house training is synonymous with “certifying” their instructors. We couldn’t disagree more. 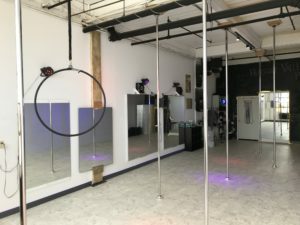 Our instructors have sought intense training in spotting, cueing, technique, and anatomy, AND were tested, reviewed, and approved to teach by experienced master instructors/pole competitors not affiliated with Hudson Valley Pole. We have safety and technique at the forefront of our minds. We’ve learned from and trained with the BEST pole dancers in the world- and our training is ongoing because we LOVE what we do! We strive to bring the very best instruction to Hudson Valley! Located in suite #115, our 700 square-foot studio also features a dressing panel for changing, and large glassless mirrors. We use dimmable track lights and LED lighting to help keep inhibitions low. We provide clean cloths and alcohol for each pole, as well as a limited number of yoga mats for warming up. We also offer knee pads for those with sensitive knees and for use in floorwork. Bottled water is also available. Let your movement flourish in a beautiful space. Come fall in love.